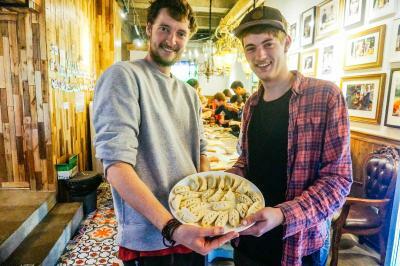 Lock in a great price for Chengdu Lazybones Hostel Boutique Poshpacker (Wenshu Monastery) – rated 8.9 by recent guests! 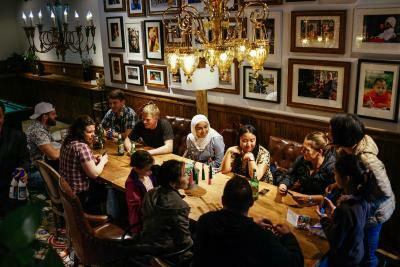 Friendly staff, good food, comfy dining area, near to good restaurants and sites of interest. Great staff, enthusiastic, helpful, and spoke English well. Food was amazingly good. Location in Wenshu area was perfect for us. Room was spacious, bed was comfortable, and shower had hot water 24 hours! This hostel was great. 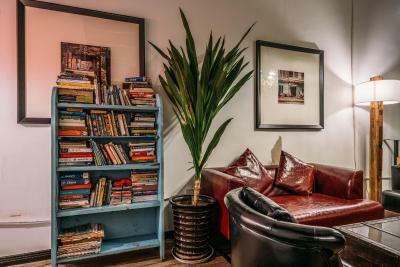 I especially liked all of the lounge space on the bottom floor to hang out and have a drink or relax. Also, the first night we got in late and were tired and decided to just eat dinner at the hostel. The food was delicious! My Room is very good, comfortable and clean. Wifi is very well. I like it. Staff had excellent english and were very helpfull. Breakfast was excellent. I have visited the property several times. I would enjoy staying there in near future. Is in a good location 10-15 min from subway station which is not bad at all in asian countries. Close to the monastery and plenty of restaurants. The girls at the front desk were amazing giving information providing help and tips for my visit in Chengdu. Jennifer is sooo helpful, Emma was great but the best was Wendy such an amazing dedicated to her job. I love that they offer activities 6 days of the week. The hostel looks well kept and always clean the cats are an amazing and enjoyable plus to this hostel, after long days walking and exploring is a nice touch to have some pets to play with and relax. Also the tours options are right on point and not expensive at all, same for the airport transportation is a good value specially when u arrive late or leave early and if you dont have didi available. I 10000% recommend this hostel do not look another eplace when u can stay in the best chengdu hostel !!! Cozy lobby, friendly staff and comfortable bunk beds with closable curtains. 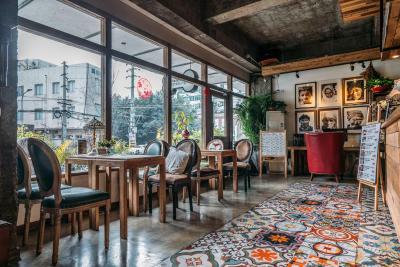 One of our top picks in Chengdu.Located in the Jinniu district in Chengdu, 2,300 feet from Wenshu Monastery, Chengdu Lazybones Hostel Templeside Poshpacker features air-conditioned rooms with free WiFi throughout the property. 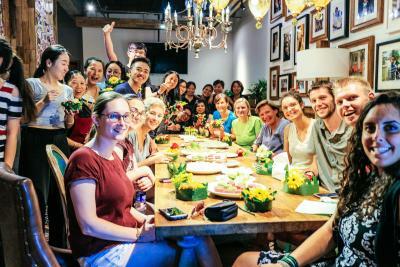 The hostel provides a rich collection of free entertainment for guests to experience the local culture such us dumpling class, Sichuan cooking class, hot pot activity, Chinese facial painting and calligraphy. Chargeable tour arrangement is possible upon request. 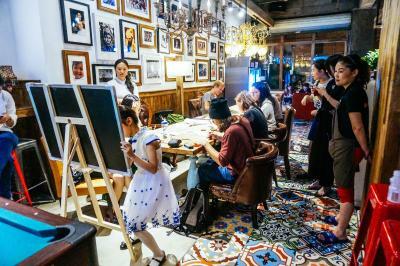 Chunxi Road is housed 1.4 mi from Chengdu Lazybones Hostel Templeside, while Tianfu Square is 1.5 mi away. Chengdu Shuangliu International Airport is 9.9 mi from the property. Each unit is air conditioned and is with comfy beddings. There is a 24-hour front desk at the property where luggage storage and express check-in/check-out are offered. Shared lounge/TV area is fitted for activities. Daily maid service is offered as well. A wide selection of local dinning options can be found in the near surroundings. 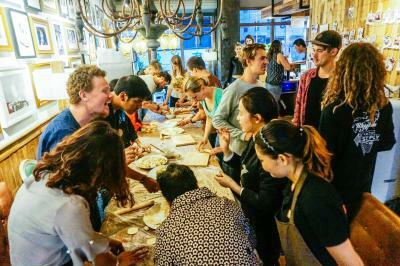 Jinniu is a great choice for travelers interested in street food, scenery and friendly locals. 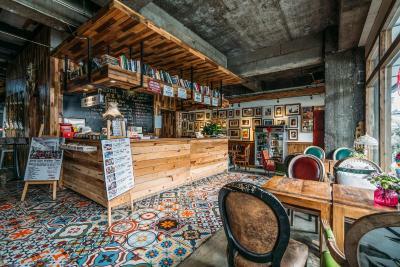 When would you like to stay at Chengdu Lazybones Hostel Boutique Poshpacker (Wenshu Monastery)? This single room has air conditioning and cable TV. This double room features a queen-sized bed, air conditioning and cable TV. This bed in dormitory has air conditioning. The dormitory room has an indoor shared toilet. The rate is for only 1 bed. This double room has air conditioning. This room only has a window facing the hall. This quadruple room has air conditioning and washing machine. This bed in dormitory features air conditioning and washing machine. 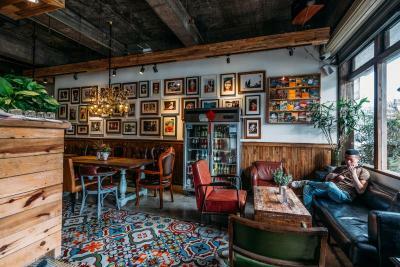 As Chengdu's first "poshpacker" hostel, we provide cool travellers vintage, stylish, lovely and yet affordable quality lodging experience! 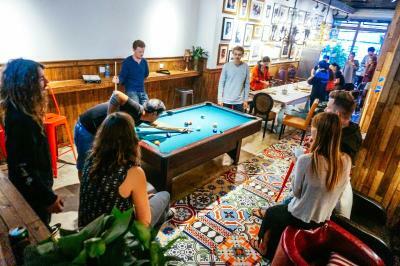 You will love here if you are looking for a designed hostel, great atmosphere, great music, with great cultural and historical heritage within stone-throw-distance, meanwhile still enjoy the convenient location. 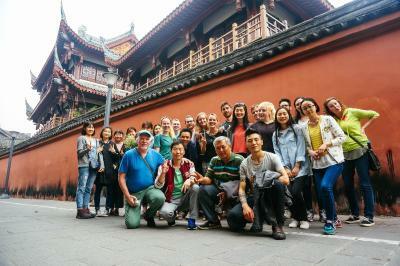 Hostel is located in downtown city, 5 mins walk from "Wenshu Monastery" (city's major historical heritage), 10 mins walk from "Wenshu Monastery" metro station Exit K, 10 mins walk from "Airport Shuttle Bus No.2", and bus stops outside hostel take you to all city attractions directly with the cost less than a dollar! Communal area provides free pool table, darts, dvd player, board games and music instrument for your pastime, wifi is covered whole area, a free computer is available 24hours for you to use. Hostel travel desk helps you to arrange trips and book the tickets. Guest rooms are with bathroom, hair dryer, cable tv and electric kettle for making a cup of tea, dorm rooms are with bed curtain, reading light and locker for your privacy and comfort. 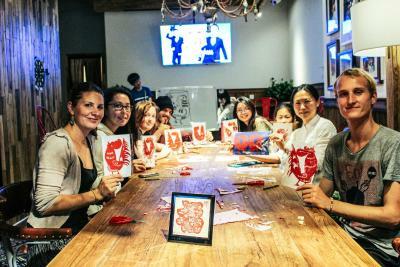 Lazybones hostel poshpacker is your perfect base to explore Chengdu city! 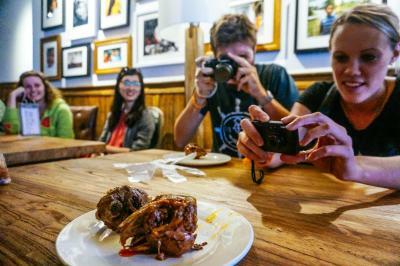 Area Info – This neighborhood is a great choice for travelers interested in street food, scenery and friendly locals – Check location Great location - show map Guests loved walking around the neighborhood! 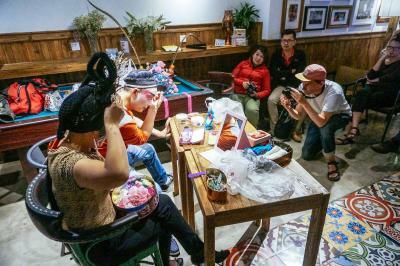 House Rules Chengdu Lazybones Hostel Boutique Poshpacker (Wenshu Monastery) takes special requests – add in the next step! 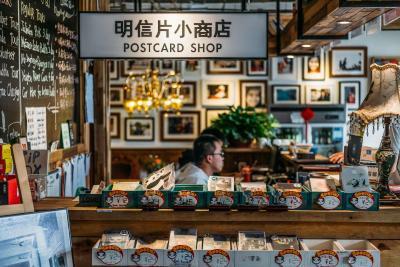 Chengdu Lazybones Hostel Boutique Poshpacker (Wenshu Monastery) accepts these cards and reserves the right to temporarily hold an amount prior to arrival. During The National Day of the People's Republic of China period, guests are required to pay the deposit via Alipay in advance to secure reservations. For those who don't have Alipay, please kindly contact the property to confirm the payment method. The property contact info can be found on the booking confirmation. 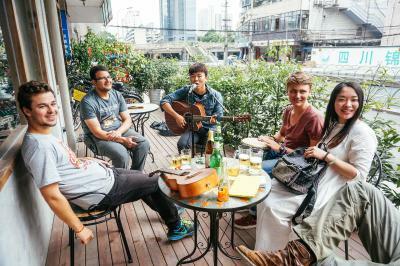 Please inform Chengdu Lazybones Hostel Boutique Poshpacker (Wenshu Monastery) of your expected arrival time in advance. You can use the Special Requests box when booking, or contact the property directly using the contact details in your confirmation. Great staff. Good at English and great to help arrange tours. Big room and comfy bed. I'v spent at the Lazybones hostel, more than 10 days and I really enjoyed it. Rooms are pretty clean, friendly people and awesome Staff. During my stayed when I had some problems with my visa, May and Helen Helped me to figuere it out.I really recommend it. The staff was super friendly. We really enjoyed the (free!) 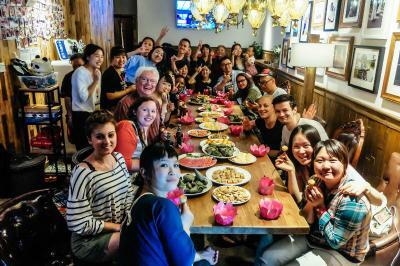 dumpling night, where we learned to make dumplings and got to eat them too! The Lazybones hostel is excellent value and we would not hesitate to stay there again. Pillows too small. Our room had no windows to the street, but only to the corridor. However, since we stayed only one night, it was not a major issue. The room was clean and comfortable. Good location. Very good breakfast options. Super friendly staff. We loved Wendy who made our one night stay very pleasant. 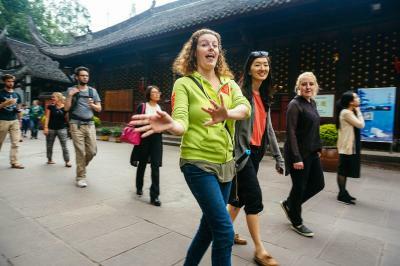 We recommend taking the half day panda visit tour that the hostel offers. The driver takes you there and back very conveniently, you get the tickets without waiting in line etc., helps to save a lot of time. The driver also took us to the right place at the right time so we could see the cutest and most active pandas right after they’ve had their breakfast. Our flight from Shanghai to Chengdu was cancelled and our replacement flight got into chengdu after midnight. I messaged the hostel advising them and they were very nice about it. When we arrived, check in was smooth and easy. Which was a nice relief after a long day. The private twin bedroom was so nice. The beds were spacious and very comfortable. Slippers were provided as well as towels, a hair dryer and toiletries. The throat sweets were a nice touch :) The location is perfect, easily accessible from the airport by didi and a nice neighbourhood for cycling around on one of the many city bikes. We walked to Wenshu Monastery which is less than 5 mins walk away, and a must see if you’re staying here. We went to the panda park which was only 25 mins or so by didi for about 37rmb. I don’t think a trip is necessary but the hostel offers so many different trips. We also bought some souvenirs from the hostel lobby which were really reasonable and a great selection. 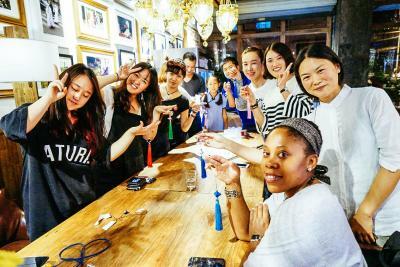 The staff were really helpful, They can speak really good English, even though I can speak Chinese-they were really lovely! So happy we stayed here. Would recommend to anyone! I’ve been traveling in China for two years now, and this was by far the best hostel stay ever. 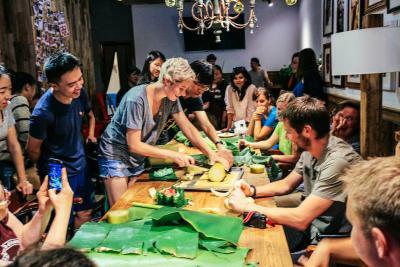 Staff were incredibly helpful and friendly and spoke excellent English, food at the restaurant was fantastic and hostel activities were great. The room was super clean, tastefully decorated and very spacious. I highly recommend this property. I loved that this hostel didn't have a "dirty" feel like hostels sometimes do. 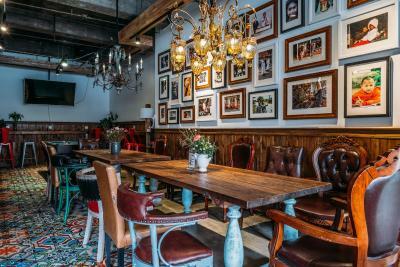 It has a feel of a upbeat, creative and relaxed space. Everything was impeccable, the girls at the front desk were so helpful (Emma, May, Wendy-hi!) and arranged a tour for an amazing price, a trip to the opera as well as an evening where we went to the local market for ingredients for hotpot! The location is a short walk to the metro and is so close to a river where I spent mornings eating breakfast. Enjoyed my stay here, but quite a walk to the metro stations. Clean, comfortable and good facilities. Close to bus stop. 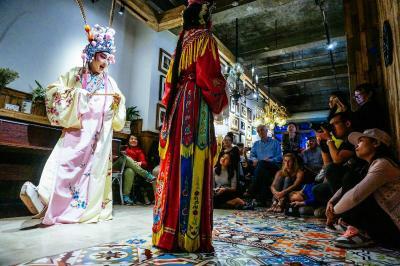 Enjoyed the Friday Sichuan opera show! !